'book talks' to my 7 year old. She loves reading, but unlike me who could read all day every day, she has to be encouraged and persuaded into trying some books. So because I know watching me is half the battle, I've been modeling reading some middle grade in front of her and discussing it. I've read some books aloud to her. I've shown her book lists and I've tried to find any book similar to Laura Ingalls Wilder as I can. 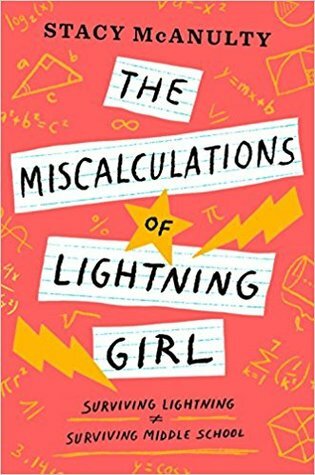 Now, this book The Miscalculations of Lightning Girl by Stacy McAnulty has nothing to do with Laura Ingalls but I have convinced my kiddo to read it some day. And she would like that some day to be way sooner but for me to read it to her. So I'll just be over here winning at my reading parenting life right now. Lucy Callahan is a 12 year old math savant. She was struck by lightning in 2nd grade and she got some stellar math skills. She also picked up some OCD habits (number related of course). She hasn't attending public school since she finished second grade. She stays in her apartment that she shares with her grandma and uses her computer to connect with other math smart people around the world. She's finished all her course work to be done with K-12 education but her grandma insists she attend at least one year of middle school and make one friend. This is harder on Lucy than any math problem ever. I really really really liked this book. It had some very authentic middle school moments. It wasn't overly preachy. It had relatable characters. They had diversity in characters throughout the book and NO BIG DEALS WERE MADE. One boy had two moms, one girl had divorced parents, one is an orphan, and they all have weird middle school quirks. I highly recommend it for adults or your middle grade reader! Description: Lucy Callahan was struck by lightning. She doesn't remember it, but it changed her life forever. The zap gave her genius-level math skills, and ever since, Lucy has been homeschooled. Now, at 12 years old, she's technically ready for college. She just has to pass 1 more test — middle school! What was a middle school book you liked? Disliked? Favorite book in middle school?